All transactions are safe and secure with a reliable history in online purchasing behind each of our associates. 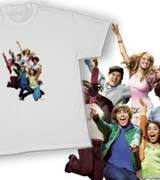 Buy the High School Musical Cast t-shirt to own High School Musical clothing and merchandise. Sing along to the High School Musical soundtrack in one of these HSM cast tees. The front of the T features an image of the cast of High School Musical throwing their hands into the air in excitement. Anyone who has ever delivered a successful performance will recognize the energy that is visible on their faces. Customize these High School Musical t-shirts by adding your name and various High School Musical quotes to the design. In addition to the High School Musical Cast tee above, browse the High School Musical Clothing Gallery for more apparel like men's and women's clothes, kids shirts or hoodies.